Map of nuclear-armed states of the world. There are eight sovereign states that have successfully detonated nuclear weapons. 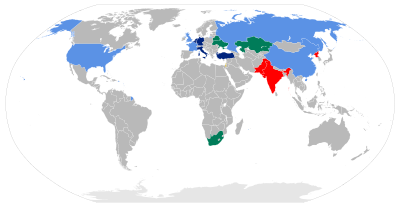 Five are considered to be nuclear-weapon states (NWS) under the terms of the Treaty on the Non-Proliferation of Nuclear Weapons (NPT). In order of acquisition of nuclear weapons these are: the United States, Russia (the successor state to the Soviet Union), the United Kingdom, France, and China. Since the NPT entered into force in 1970, three states that were not parties to the Treaty have conducted announced nuclear tests, namely India, Pakistan, and North Korea. North Korea had been a party to the NPT but withdrew in 2003. It is now clear that Israel conducted at least one secret test in 1979 in the oceans south of South Africa. Israel is also generally understood to have nuclear weapons, but does not acknowledge it, maintaining a policy of deliberate ambiguity, and is not known definitively to have conducted a nuclear test. Israel is estimated to possess somewhere between 75 and 400 nuclear warheads. One possible motivation for nuclear ambiguity is deterrence with minimum political cost. States that formerly possessed nuclear weapons are South Africa (developed nuclear weapons but then disassembled its arsenal before joining the NPT) and the former Soviet republics Belarus, Kazakhstan, and Ukraine. According to SIPRI, the worldwide total inventory of nuclear weapons as of 2018 stood at 14,465, of which 3,750 were deployed with operational forces. The following is a list of states that have admitted the possession of nuclear weapons or are presumed to possess them, the approximate number of warheads under their control, and the year they tested their first weapon and their force configuration. This list is informally known in global politics as the "Nuclear Club". With the exception of Russia and the United States (which have subjected their nuclear forces to independent verification under various treaties) these figures are estimates, in some cases quite unreliable estimates. In particular, under the Strategic Offensive Reductions Treaty thousands of Russian and U.S. nuclear warheads are inactive in stockpiles awaiting processing. The fissile material contained in the warheads can then be recycled for use in nuclear reactors. From a high of 70,300 active weapons in 1986, as of 2018[update] there are approximately 3,750 active nuclear warheads and 14,485 total nuclear warheads in the world. Many of the decommissioned weapons were simply stored or partially dismantled, not destroyed. It is also noteworthy that since the dawn of the Atomic Age, the delivery methods of most states with nuclear weapons has evolved with some achieving a nuclear triad, while others have consolidated away from land and air deterrents to submarine-based forces. Israel 0 / 80 1960–1979 incl. suspected Vela Incident Signatory Suspected nuclear triad. These five states are known to have detonated a nuclear explosive before 1 January 1967 and are thus nuclear weapons states under the Treaty on the Non-Proliferation of Nuclear Weapons. They also happen to be the UN Security Council's permanent members with veto power on UNSC resolutions. The United States developed the first nuclear weapons during World War II in cooperation with the United Kingdom and Canada as part of the Manhattan Project, out of the fear that Nazi Germany would develop them first. It tested the first nuclear weapon on July 16, 1945 ("Trinity") at 5:30 am, and remains the only country to have used nuclear weapons in war, devastating the Japanese cities of Hiroshima and Nagasaki. It was the first nation to develop the hydrogen bomb, testing an experimental prototype in 1952 ("Ivy Mike") and a deployable weapon in 1954 ("Castle Bravo"). Throughout the Cold War it continued to modernize and enlarge its nuclear arsenal, but from 1992 on has been involved primarily in a program of Stockpile stewardship. The U.S. nuclear arsenal contained 31,175 warheads at its Cold War height (in 1966). During the Cold War, the United States built approximately 70,000 nuclear warheads, more than all other nuclear-weapon states combined. The Soviet Union tested its first nuclear weapon ("RDS-1") in 1949. This crash project was developed partially with information obtained via espionage during and after World War II. The Soviet Union was the second nation to have developed and tested a nuclear weapon. The direct motivation for Soviet weapons development was to achieve a balance of power during the Cold War. It tested its first megaton-range hydrogen bomb ("RDS-37") in 1955. The Soviet Union also tested the most powerful explosive ever detonated by humans, ("Tsar Bomba"), with a theoretical yield of 100 megatons, intentionally reduced to 50 when detonated. After its dissolution in 1991, the Soviet weapons entered officially into the possession of the Russian Federation. 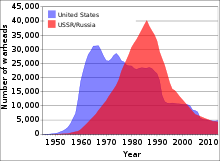 The Soviet nuclear arsenal contained some 45,000 warheads at its peak (in 1986); the Soviet Union built about 55,000 nuclear warheads since 1949. The United Kingdom tested its first nuclear weapon ("Hurricane") in 1952. The UK had provided considerable impetus and initial research for the early conception of the atomic bomb, aided by Austrian, German and Polish physicists working at British universities who had either fled or decided not to return to Nazi Germany or Nazi controlled territories. The UK collaborated closely with the United States and Canada during the Manhattan Project, but had to develop its own method for manufacturing and detonating a bomb as U.S. secrecy grew after 1945. The United Kingdom was the third country in the world, after the United States and Soviet Union, to develop and test a nuclear weapon. Its programme was motivated to have an independent deterrent against the Soviet Union, while also maintaining its status as a great power. It tested its first hydrogen bomb in 1957 (Operation Grapple), making it the third country to do so after the United States and Soviet Union. The UK maintained a fleet of V bomber strategic bombers and ballistic missile submarines (SSBNs) equipped with nuclear weapons during the Cold War. 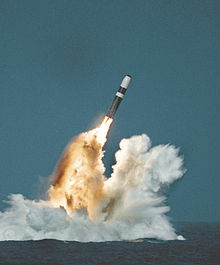 It currently maintains a fleet of four 'Vanguard' class ballistic missile submarines equipped with Trident II missiles. In 2016, the UK House of Commons voted to renew the British nuclear weapons system with the Dreadnought-class submarine, without setting a date for the commencement of service of a replacement to the current system. France tested its first nuclear weapon in 1960 ("Gerboise Bleue"), based mostly on its own research. It was motivated by the Suez Crisis diplomatic tension vis-à-vis both the Soviet Union and the Free World allies United States and United Kingdom. It was also relevant to retain great power status, alongside the United Kingdom, during the post-colonial Cold War (see: Force de frappe). France tested its first hydrogen bomb in 1968 ("Opération Canopus"). After the Cold War, France has disarmed 175 warheads with the reduction and modernization of its arsenal that has now evolved to a dual system based on submarine-launched ballistic missiles (SLBMs) and medium-range air-to-surface missiles (Rafale fighter-bombers). However new nuclear weapons are in development and reformed nuclear squadrons were trained during Enduring Freedom operations in Afghanistan. France signed the Nuclear Non-Proliferation Treaty in 1992. In January 2006, President Jacques Chirac stated a terrorist act or the use of weapons of mass destruction against France would result in a nuclear counterattack. In February 2015, President Francois Hollande stressed the need for a nuclear deterrent in "a dangerous world". He also detailed the French deterrent as "less than 300" nuclear warheads, three sets of 16 submarine-launched ballistic missiles and 54 medium-range air-to-surface missiles" and urged other states to show similar transparency. China tested its first nuclear weapon device ("596") in 1964 at the Lop Nur test site. The weapon was developed as a deterrent against both the United States and the Soviet Union. Two years later, China had a fission bomb capable of being put onto a nuclear missile. It tested its first hydrogen bomb ("Test No. 6") in 1967, a mere 32 months after testing its first nuclear weapon (the shortest fission-to-fusion development known in history). The country is currently thought to have had a stockpile of around 240 warheads, though because of the limited information available, estimates range from 100 to 400. China is the only NPT nuclear-weapon state to give an unqualified negative security assurance with its "no first use" policy. China signed the Nuclear Non-Proliferation Treaty in 1992. On February 25, 2015 U.S. Vice Admiral Joseph Mulloy stated to the House Armed Services Committee's seapower subcommittee that the U.S. does not believe the PLAN currently deploys SLBMs on their submarine fleet. India is not a party to the Nuclear Non-Proliferation Treaty. India tested what it called a "peaceful nuclear explosive" in 1974 (which became known as "Smiling Buddha"). The test was the first test developed after the creation of the NPT, and created new questions about how civilian nuclear technology could be diverted secretly to weapons purposes (dual-use technology). India's secret development caused great concern and anger particularly from nations that had supplied its nuclear reactors for peaceful and power generating needs, such as Canada. Indian officials rejected the NPT in the 1960s on the grounds that it created a world of nuclear "haves" and "have-nots", arguing that it unnecessarily restricted "peaceful activity" (including "peaceful nuclear explosives"), and that India would not accede to international control of their nuclear facilities unless all other countries engaged in unilateral disarmament of their own nuclear weapons. The Indian position has also asserted that the NPT is in many ways a neo-colonial regime designed to deny security to post-colonial powers. Even after its 1974 test, India maintained that its nuclear capability was primarily "peaceful", but between 1988 and 1990 it apparently weaponized two dozen nuclear weapons for delivery by air. In 1998 India tested weaponized nuclear warheads ("Operation Shakti"), including a thermonuclear device. In July 2005, U.S. President George W. Bush and Indian Prime Minister Manmohan Singh announced plans to conclude an Indo-US civilian nuclear agreement. This came to fruition through a series of steps that included India's announced plan to separate its civil and military nuclear programs in March 2006, the passage of the India–United States Civil Nuclear Agreement by the U.S. Congress in December 2006, the conclusion of a U.S.–India nuclear cooperation agreement in July 2007, approval by the IAEA of an India-specific safeguards agreement, agreement by the Nuclear Suppliers Group to a waiver of export restrictions for India, approval by the U.S. Congress and culminating in the signature of U.S.–India agreement for civil nuclear cooperation in October 2008. The U.S. State Department said it made it "very clear that we will not recognize India as a nuclear-weapon state". The United States is bound by the Hyde Act with India and may cease all cooperation with India if India detonates a nuclear explosive device. The US had further said it is not its intention to assist India in the design, construction or operation of sensitive nuclear technologies through the transfer of dual-use items. In establishing an exemption for India, the Nuclear Suppliers Group reserved the right to consult on any future issues which might trouble it. As of December 2017, India was estimated to have a stockpile of around 130 warheads. Pakistan also is not a party to the Nuclear Non-Proliferation Treaty. Pakistan covertly developed nuclear weapons over decades, beginning in the late 1970s. Pakistan first delved into nuclear power after the establishment of its first nuclear power plant near Karachi with equipment and materials supplied mainly by western nations in the early 1970s. Pakistani President Zulfiqar Ali Bhutto promised in 1971 that if India could build nuclear weapons then Pakistan would too, according to him: "We will develop Nuclear stockpiles, even if we have to eat grass." It is believed that Pakistan has possessed nuclear weapons since the mid-1980s. The United States continued to certify that Pakistan did not possess such weapons until 1990, when sanctions were imposed under the Pressler Amendment, requiring a cutoff of U.S. economic and military assistance to Pakistan. In 1998, Pakistan conducted its first six nuclear tests at the Ras Koh Hills in response to the five tests conducted by India a few weeks before. In 2004, the Pakistani metallurgist Abdul Qadeer Khan, a key figure in Pakistan's nuclear weapons program, confessed to heading an international black market ring involved in selling nuclear weapons technology. In particular, Khan had been selling gas centrifuge technology to North Korea, Iran, and Libya. Khan denied complicity by the Pakistani government or Army, but this has been called into question by journalists and IAEA officials, and was later contradicted by statements from Khan himself. As of early 2013, Pakistan was estimated to have had a stockpile of around 140 warheads, and in November 2014 it was projected that by 2020 Pakistan would have enough fissile material for 200 warheads. The South Korean government welcomed the DPRK's unilateral nuclear concession to help facilitate a broader agreement with the United States to completely end its nuclear weapons program. Israel is widely believed to have been the sixth country in the world to develop nuclear weapons, but has not acknowledged its nuclear forces. It had "rudimentary, but deliverable," nuclear weapons available as early as 1966. Israel is not a party to the NPT. Israel engages in strategic ambiguity, saying it would not be the first country to "introduce" nuclear weapons into the region, but refusing to otherwise confirm or deny a nuclear weapons program or arsenal. This policy of "nuclear opacity" has been interpreted as an attempt to get the benefits of deterrence with a minimal political cost. According to the Natural Resources Defense Council and the Federation of American Scientists, Israel likely possesses around 75–200 nuclear weapons. The Stockholm International Peace Research Institute estimates that Israel has approximately 80 intact nuclear weapons, of which 50 are for delivery by Jericho II medium-range ballistic missiles and 30 are gravity bombs for delivery by aircraft. SIPRI also reports that there was renewed speculation in 2012 that Israel may also have developed nuclear-capable submarine-launched cruise missiles. Under NATO nuclear weapons sharing, the United States has provided nuclear weapons for Belgium, Germany, Italy, the Netherlands, and Turkey to deploy and store. This involves pilots and other staff of the "non-nuclear" NATO states practicing, handling, and delivering the U.S. nuclear bombs, and adapting non-U.S. warplanes to deliver U.S. nuclear bombs. However, since all U.S. nuclear weapons are protected with Permissive Action Links, the host states cannot easily arm the bombs without authorization codes from the U.S. Department of Defense. Former Italian President Francesco Cossiga acknowledged the presence of U.S. nuclear weapons in Italy. U.S. nuclear weapons were also deployed in Canada as well as Greece from 1963 to 1984. However, Canada withdrew three of the four nuclear-capable weapons systems by 1972. The single system retained, the AIR-2 Genie, had a yield of 1.5 kilotons, was designed to strike enemy aircraft as opposed to ground targets, and might not have qualified as a weapon of mass destruction given its limited yield. Members of the Non-Aligned Movement have called on all countries to "refrain from nuclear sharing for military purposes under any kind of security arrangements." The Institute of Strategic Studies Islamabad (ISSI) has criticized the arrangement for allegedly violating Articles I and II of the NPT, arguing that "these Articles do not permit the NWS to delegate the control of their nuclear weapons directly or indirectly to others." NATO has argued that the weapons' sharing is compliant with the NPT because "the U.S. nuclear weapons based in Europe are in the sole possession and under constant and complete custody and control of the United States." Nuclear weapons have been present in many nations, often as staging grounds under control of other powers. However, in only one instance has a nation given up nuclear weapons after being in full control of them. The fall of the Soviet Union left several former Soviet republics in physical possession of nuclear weapons, though not operational control which was dependent on Russian-controlled electronic Permissive Action Links and the Russian command and control system. Alleged spare bomb casings from South Africa's nuclear weapon programme. Their purpose is disputed. 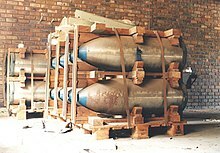 South Africa produced six nuclear weapons in the 1980s, but dismantled them in the early 1990s. In 1979, there was a detection of a putative covert nuclear test in the Indian Ocean, called the Vela incident. It has long been speculated that it was a test by Israel, in collaboration with and support of South Africa, though this has never been confirmed. South Africa could not have constructed such a nuclear bomb until November 1979, two months after the "double flash" incident. South Africa signed the Nuclear Non-Proliferation Treaty in 1991. Belarus had 81 single warhead missiles stationed on its territory after the Soviet Union collapsed in 1991. They were all transferred to Russia by 1996. In May 1992, Belarus acceded to the Nuclear Non-Proliferation Treaty. Kazakhstan inherited 1,400 nuclear weapons from the Soviet Union, and transferred them all to Russia by 1995. Kazakhstan has since acceded to the Nuclear Non-Proliferation Treaty. Ukraine has acceded to the Nuclear Non-Proliferation Treaty. Ukraine inherited approximately 5,000 nuclear weapons when it became independent from the Soviet Union in 1991, making its nuclear arsenal the third-largest in the world. By 1994, Ukraine had agreed to dispose of all nuclear weapons within its territory, with the condition that its borders were respected, as part of the Budapest Memorandum on Security Assurances. The warheads were removed from Ukraine by 1996 and disassembled in Russia. Despite Russia's subsequent and internationally disputed annexation of Crimea in 2014, Ukraine reaffirmed its 1994 decision to accede to the Nuclear Non-Proliferation Treaty as a non-nuclear-weapon state. ^ All numbers are estimates from the Federation of American Scientists. The latest update was in November 2018. "Deployed" indicates the total of deployed strategic and non-strategic warheads. Because the number of non-strategic warheads is unknown for many countries, this number should be taken as a minimum. When a range of weapons is given (e.g., 0–10), it generally indicates that the estimate is being made on the amount of fissile material that has likely been produced, and the amount of fissile material needed per warhead depends on estimates of a country's proficiency at nuclear weapon design. ^ From the 1960s until the 1990s, the United Kingdom's Royal Air Force maintained the independent capability to deliver nuclear weapons via its V bomber fleet. ^ France formerly possessed a nuclear triad until 1996 and the retirement of its land-based arsenal. ^ a b c d e f g h i j "Status of World Nuclear Forces". Federation of American Scientists. 1 November 2018. Retrieved 22 February 2019. ^ "Nuclear Weapons: Who Has What at a Glance". Arms Control Association. October 2016. Retrieved Jan 16, 2017. India, Israel, and Pakistan never signed the NPT and possess nuclear arsenals. ^ Rosen, Armin (Nov 10, 2014). "Israel's Nuclear Arsenal Might Be Smaller And More Strategic Than Everyone Thinks". Business Insider. The country possesses some of the most powerful weaponry on earth, along with delivery systems that give it the ability to strike far beyond its borders. ^ "Israel". Nuclear Threat Initiative. May 2015. Retrieved Jan 16, 2017. While experts generally agree that Israel possesses nuclear weapons, no such current open source consensus exists on the status of Israel's offensive chemical or biological weapons programs. ^ Harding, Luke (2006-12-12). "Calls for Olmert to resign after nuclear gaffe Israel and the Middle East | Guardian Unlimited". London: Guardian. Retrieved 2009-05-15. ^ There are a wide range of estimates as to the size of the Israeli nuclear arsenal. For a compiled list of estimates, see Avner Cohen, The Worst-Kept Secret: Israel's bargain with the Bomb (Columbia University Press, 2010), Table 1, page xxvii and page 82. ^ a b c NTI Israel Profile Retrieved July 12, 2007. ^ a b Avner Cohen (2010). The Worst-Kept Secret: Israel's bargain with the Bomb. Columbia University Press. ^ "SIPRI Yearbook 2018: Armaments, Disarmament and International Security" (PDF). ^ "Nuclear club", Oxford English Dictionary: "nuclear club n. the nations that possess nuclear weapons." The term's first cited usage is from 1957. ^ Webster, Paul (July/August 2003). "Nuclear weapons: how many are there in 2009 and who has them?" The Guardian, 6 September 2009. ^ a b c d e f g h i "Status of Signature and Ratification of the Comprehensive Test Ban Treaty". Retrieved 13 January 2012. ^ Kristensen, Hans M.; Korda, Matt (2019-03-04). "Russian nuclear forces, 2019". Bulletin of the Atomic Scientists. 75 (2): 73–84. doi:10.1080/00963402.2019.1580891. ISSN 0096-3402. ^ The Long Shadow: Nuclear Weapons and Security in 21st Century Asia by Muthiah Alagappa (NUS Press, 2009), page 169: "China has developed strategic nuclear forces made up of land-based missiles, submarine-launched missiles, and bombers. Within this triad, China has also developed weapons of different ranges, capabilities, and survivability." ^ "Now, India has a nuclear triad". The Hindu. 18 October 2016. Retrieved 24 December 2016. ^ Peri, Dinakar (12 June 2014). "India's Nuclear Triad Finally Coming of Age". The Diplomat. Retrieved 10 March 2015. ^ "Nuclear triad weapons ready for deployment: DRDO". 2014-07-07. ^ Pakistan's Nuclear Weapons. Bhumitra Chakma (Routledge 2012), page 61: "Pakistan possesses two types of nuclear delivery vehicles: aircraft and missiles. Initially in the pre-tests era, Islamabad depended solely on aircraft as its chief means of delivering nuclear weapons. In the early 1990s, Pakistan acquired a few dozen ballistic missiles from China, and subsequently, it developed a number of missile systems which became its mainstay of nuclear delivery." ^ "U.S.: Test Points to N. Korea Nuke Blast". The Washington Post. October 13, 2006. ^ Farr, Warner D (September 1999), The Third Temple's holy of holies: Israel's nuclear weapons, The Counterproliferation Papers, Future Warfare Series 2, USAF Counterproliferation Center, Air War College, Air University, Maxwell Air Force Base, retrieved July 2, 2006. ^ An Atlas of Middle Eastern Affairs By Ewan W. Anderson, Liam D. Anderson, (Routledge 2013), page 233: "In terms of delivery systems, there is strong evidence that Israel now possesses all three elements of the nuclear triad." ^ Hansen, Chuck (1988). U.S. nuclear weapons: The secret history. Arlington, TX: Aerofax. ISBN 978-0-517-56740-1. ^ Hansen, Chuck (1995). The Swords of Armageddon: U.S. nuclear weapons development since 1945. Sunnyvale, CA: Chukelea Publications. Retrieved 2016-02-20. ^ Stephen I. Schwartz, ed., Atomic Audit: The Costs and Consequences of U.S. Nuclear Weapons Since 1940 (Washington, D.C.: Brookings Institution Press, 1998). ^ Gross, Daniel A. (2016). "An Aging Army". Distillations. Vol. 2 no. 1. pp. 26–36. Retrieved 22 March 2018. ^ "Fact Sheet: Increasing Transparency in the U.S. Nuclear Weapons Stockpile" (PDF). U.S. Department of Defense. 3 May 2010. Archived from the original (PDF) on 28 June 2015. Retrieved 31 August 2013. ^ Holloway, David (1994). Stalin and the bomb: The Soviet Union and atomic energy, 1939-1956. New Haven, CT: Yale University Press. ISBN 978-0-300-06056-0. ^ Gowing, Margaret (1974). Independence and deterrence: Britain and atomic energy, 1945-1952. London: Macmillan. ISBN 978-0-333-15781-7. ^ Arnold, Lorna (2001). Britain and the H-bomb. Basingstoke: Palgrave. ISBN 978-0-312-23518-5. ^ a b Treaty on the Non-Proliferation of Nuclear Weapons, United Nations Office for Disarmament Affairs. ^ "Nuclear deterrent important in 'dangerous world', says Hollande". spacedaily.com. Retrieved 2016-02-20. ^ Norris, Robert S. and Hans M. Kristensen. "Chinese nuclear forces, 2006[dead link]," Bulletin of the Atomic Scientists 62:3 (May/June 2006): 60-63. ^ Lewis, Jeffery. "The ambiguous arsenal[dead link]," Bulletin of the Atomic Scientists 61:3 (May/June 2005): 52-59. ^ "No-First-Use (NFU)". Nuclear Threat Initiative. Archived from the original on 2010-01-25. ^ "Statement on security assurances issued on 5 April 1995 by the People's Republic of China". United Nations. 6 April 1995. S/1995/265. Archived from the original on 2007-08-24. Retrieved 20 September 2012. ^ Reuters Editorial (25 February 2015). "China submarines outnumber U.S. fleet: U.S. admiral". Reuters. ^ "18 MAY 1974 - SMILING BUDDAH". CTBTO. Retrieved 24 January 2018. ^ George Perkovich, India's Nuclear Bomb: The Impact on Global Proliferation (Berkeley: University of California Press, 1999), 120-121, and 7. ^ George Perkovich, India's Nuclear Bomb: The Impact on Global Proliferation (Berkeley: University of California Press, 1999), 293–297. ^ "India's Nuclear Weapons Program: Operation Shakti". 1998. Retrieved 2006-10-10. ^ "Joint Statement Between President George W. Bush and Prime Minister Manmohan Singh". Whitehouse.gov. Retrieved 2009-05-15. ^ "Wayback Machine" (PDF). 3 September 2006. Archived from the original (PDF) on 3 September 2006. ^ "U.S.- India Civil Nuclear Cooperation Initiative – Bilateral Agreement on Peaceful Nuclear Cooperation". Archived from the original on 2007-10-10. ^ "IAEA Board Approves India-Safeguards Agreement". Iaea.org. 2008-07-31. Retrieved 2009-05-15. ^ "Statement on Civil Nuclear Cooperation with India" (PDF). ^ "Congressional Approval of the U.S.-India Agreement for Cooperation Concerning Peaceful Uses of Nuclear Energy (123 Agreement)". Archived from the original on 2008-10-04. ^ "Secretary of State Condoleezza Rice and Indian Minister of External Affairs Pranab Mukherjee At the Signing of the U.S.-India Civilian Nuclear Cooperation Agreement". Archived from the original on 2008-12-10. ^ Interview With Undersecretary of State for Arms Control and International Security Robert Joseph, Arms Control Today, May 2006. ^ Was India misled by America on nuclear deal? Archived 2008-09-10 at the Wayback Machine, Indian Express. ^ "ACA: Final NSG Statement" (PDF). ^ a b "Status of World Nuclear Forces". Federation of American Scientists. Archived from the original on 24 January 2018. Retrieved 24 January 2018. ^ Sublettle, Carey (15 October 1965). "Historical Background: Zulfikar Ali Bhutto". Nuclear weapons archives. Federation of American Scientists (FAS). Retrieved 19 August 2018. ^ NTI Pakistan Profile, retrieved 22 April 2012. ^ "Case Studies in Sanctions and Terrorism: Pakistan". Iie.com. Retrieved 2009-05-15. ^ See A.Q. Khan: Investigation, dismissal, confession, pardon and aftermath, for citations and details. ^ "Pakistan to Have 200 Nuke Weapons by 2020: US Think Tank". The Times of india. November 2014. Retrieved 2014-11-28. ^ "CIA's Hayden: North Korea Nuke Test 'Was a Failure'". Newsmax.com. 2007-03-28. Archived from the original on 2012-09-04. Retrieved 2009-05-15. ^ "North Korea Test Shows Technical Advance". The Wall Street Journal. CCLXVII (5). January 7, 2016. p. A6. ^ "North Korea has Begun Dismantlement of the Punggye-ri Nuclear Test Site'". www.38north.org/. Retrieved Aug 3, 2018. ^ "'Destruction at North Korea's Nuclear Test Site: A Review in Photos'". www.38north.org/. Retrieved Aug 3, 2018. ^ Cohen 1998a, p. 349. ^ ElBaradei, Mohamed (July 27, 2004). "Transcript of the Director General's Interview with Al-Ahram News". International Atomic Energy Agency. Retrieved June 3, 2007. ^ "Nuclear Overview". Israel. NTI. Archived from the original (profile) on January 2, 2009. Retrieved June 23, 2009. ^ Nuclear Proliferation International History Project (2013-06-28). "Israel's Quest for Yellowcake: The Secret Argentina-Israel Connection, 1963–1966". Woodrow Wilson International Center for Scholars. ^ John Pike. "Nuclear Weapons". globalsecurity.org. ^ Hans M. Kristensen (26 June 2008). "Status of U.S. Nuclear Weapons in Europe". Federation of American Scientists. Retrieved 10 November 2012. ^ "US moves nuclear weapons from Turkey to Romania". EurActiv.com. 2016-08-18. Retrieved 2016-08-18. ^ Tirinnanzi, Luciano (24 April 2013). "Armi nucleari in Italia: dove, come, perché - Panorama". ^ "US nuclear bombs 'based in Netherlands' - ex-Dutch PM Lubbers". BBC News. BBC. 10 June 2013. Retrieved 10 June 2013. ^ "Berlin Information-center for Transatlantic Security: NATO Nuclear Sharing and the N.PT - Questions to be Answered". Bits.de. Retrieved 2009-05-15. ^ "Nuclear Command and Control" (PDF). Security Engineering: A Guide to Building Dependable Distributed Systems. Ross Anderson, University of Cambridge Computing Laboratory. Retrieved April 29, 2010. ^ "Cossiga: "In Italia ci sono bombe atomiche Usa"". ^ Hans M. Kristensen (February 2005). "U.S. Nuclear Weapons in Europe" (PDF). Natural Resources Defense Council. Retrieved 2006-05-23. ^ "NATO's Positions Regarding Nuclear Non-Proliferation, Arms Control and Disarmament and Related Issues" (PDF). NATO. ^ William C. Martel (1998). "Why Ukraine gave up nuclear weapons : nonproliferation incentives and disincentives". In Barry R. Schneider, William L. Dowdy. Pulling Back from the Nuclear Brink: Reducing and Countering Nuclear Threats. Psychology Press. pp. 88–104. ISBN 9780714648569. Retrieved 6 August 2014. ^ Alexander A. Pikayev (Spring–Summer 1994). "Post-Soviet Russia and Ukraine: Who can push the Button?" (PDF). The Nonproliferation Review. 1 (3): 31–46. doi:10.1080/10736709408436550. Retrieved 6 August 2014. ^ Lewis, Jeffrey (3 December 2015). "Revisiting South Africa's Bomb". Arms Control Wonk. Leading Voice on Arms Control, Disarmament and Non-Proliferation. Retrieved 6 December 2015. ^ Nuclear Weapons Program (South Africa), Federation of American Scientists (May 29, 2000). ^ Von Wielligh, N. & von Wielligh-Steyn, L. (2015). The Bomb – South Africa's Nuclear Weapons Programme. Pretoria: Litera. ^ "Belarus Special Weapons". Federation of American Scientists. ^ "Kazakhstan Special Weapons". Federation of American Scientists. ^ "Ukraine Special Weapons". Federation of American Scientists. ^ Joint Statement by the United States and Ukraine, March 25, 2014. Farr, Warner D (September 1999), The Third Temple's holy of holies: Israel's nuclear weapons, The Counterproliferation Papers, Future Warfare Series, 2, USAF Counterproliferation Center, Air War College, Air University, Maxwell Air Force Base, retrieved July 2, 2006 . Philipp C. Bleek, “When Did (and Didn’t) States Proliferate? Chronicling the Spread of Nuclear Weapons,” Discussion Paper (Cambridge, MA: Project on Managing the Atom, Belfer Center for Science and International Affairs, June 2017). Nuclear Proliferation International History Project For more on the history of nuclear proliferation see the Woodrow Wilson Center's Nuclear Proliferation International History Project website.